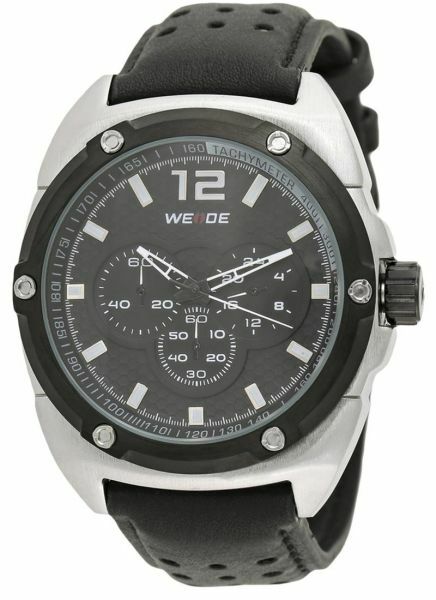 The Weide Sports Men's Quartz Original Japan Miyota 2035 Quartz Watch is a trendy wristwatch for your man who loves outdoors. sturdy Hardlex dial glass covers this lovely watch face. Attractive design and comfort to wear. Vacuum IP silver electro-plating, band of this watch is made using high quality PU leather. Laser LOGO on case back and buckle. It looks very attractive. It is powered by petite, yet powerful original batteries that lasts for a very long time to come. The watch pairs up perfectly with your casual as well as formal attire. Advanced manufacturing technology, wear well and wear comfortable.